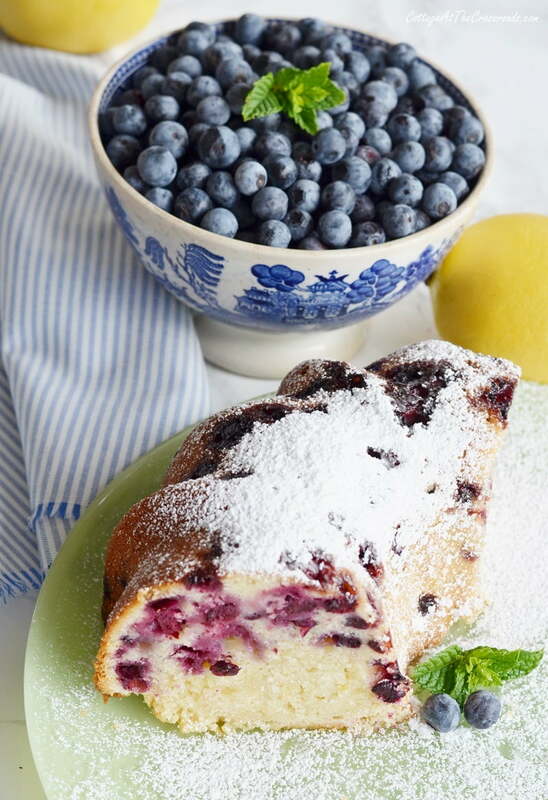 This blueberry lemon pound cake is a delicious match of sweet and tangy! Oh my goodness, friends! I have something delicious to share with you today. 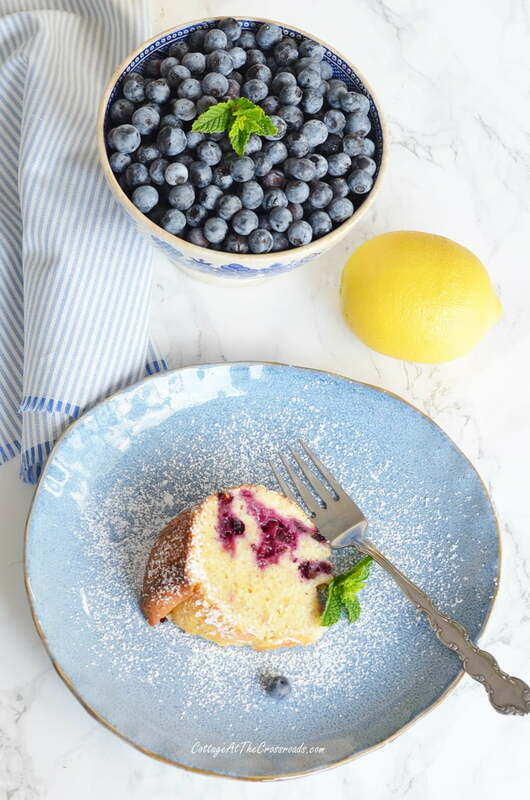 It’s this blueberry lemon pound cake that’s bursting with blueberry awesomeness that’s perfectly paired with lemon flavor! I used fresh blueberries that I had picked from our bushes in our garden which yielded an extraordinary amount of blueberries this year. 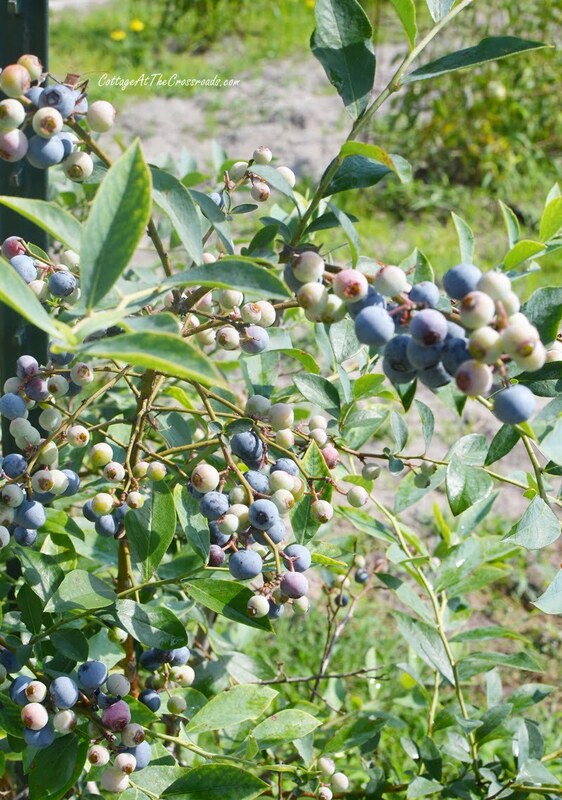 Sadly, our season is over because I snacked on the last few remaining blueberries on the bushes yesterday. This post contains affiliate links. To see more of our disclosure policy, go HERE. To make this cake, you’re going to need 2 cups of blueberries. 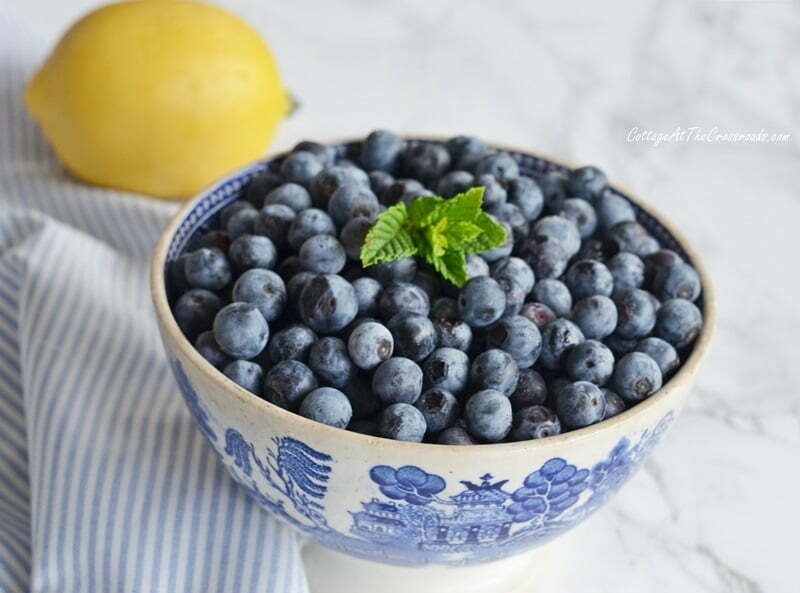 Fresh is always best, but you can use frozen blueberries. Just let them thaw and drain in a colander before using. 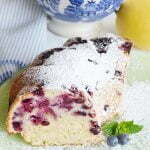 Although there are a lot of recipes for blueberry lemon pound cake, this one is special because I used this lemon oil. You may be tempted to make this cake without it, but it gives the cake a real lemony zing. I purchased the all natural lemon oil on Amazon. It gives a real depth of flavor that you cannot get with just lemon juice. To get started preheat your oven to 350 degrees and spray a large bundt pan with baking spray. I always use Baker’s Joy with good results. And this is my new bundt pan that I used which has a nonstick finish. I got mine at Bed, Bath, and Beyond but on Amazon, you can get it in pink! Yes, pink! 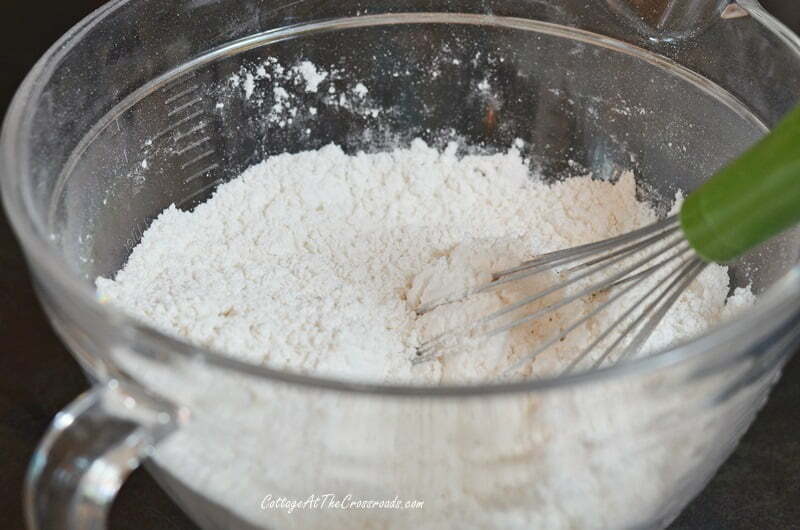 In a medium bowl, whisk together 2 3/4 cups flour, 2 teaspoons baking powder, and 1/2 teaspoon salt. Set aside. In a stand mixer fitted with the paddle attachment, cream together 2 sticks butter and 1 3/4 cups sugar. In a small bowl, mix together 1/2 cup buttermilk and 1/2 cup lemon juice. 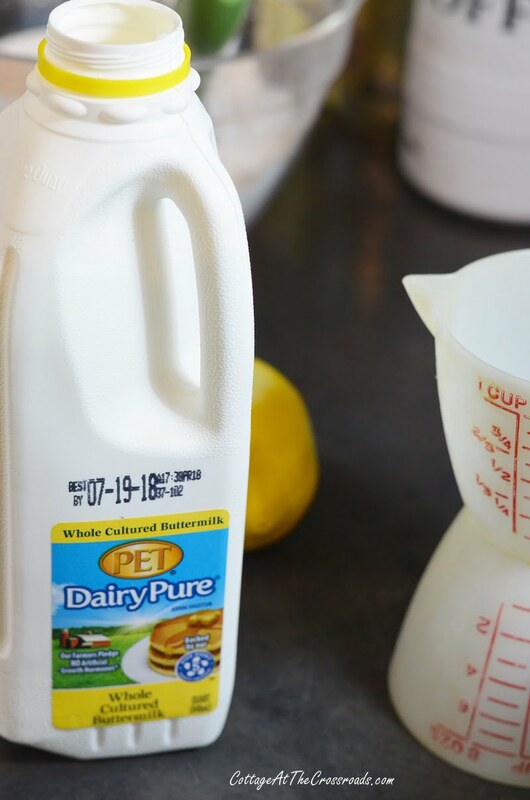 If you cannot find buttermilk, you can make your own by adding a teaspoon of white vinegar to 1 cup of milk. Let it sit for a few minutes. Next, you are going to zest one lemon. 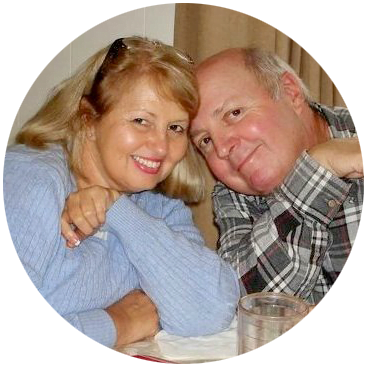 I don’t know if you have a zester or not. I’ve linked to this pretty microplane one that I found on Amazon. Mine has a black handle, and I’ve had it a long time. 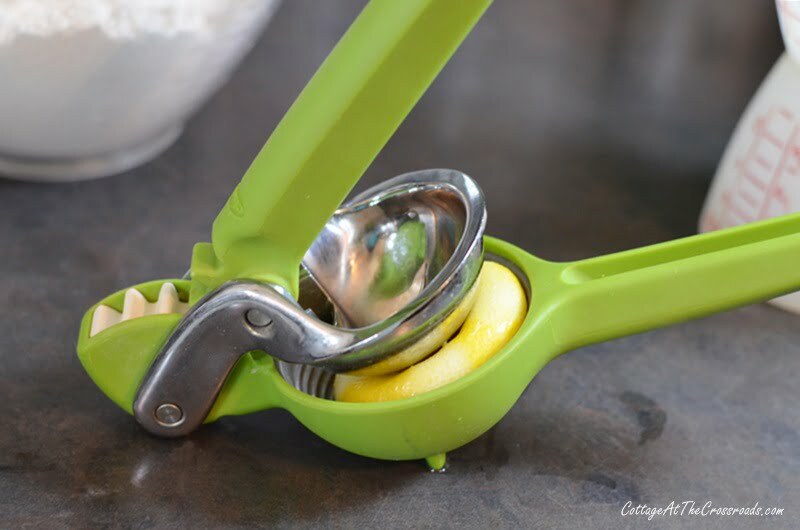 I love the little brush that comes with this one so that you can more easily gather the zest. Add the zest, 1 teaspoon of vanilla extract, and 4 large eggs (one at a time) to the creamed butter and sugar. Starting and ending with the flour mixture, add the flour mixture alternatively with the buttermilk mixture and blend after each addition. Take care not to overmix or your cake will be tough. 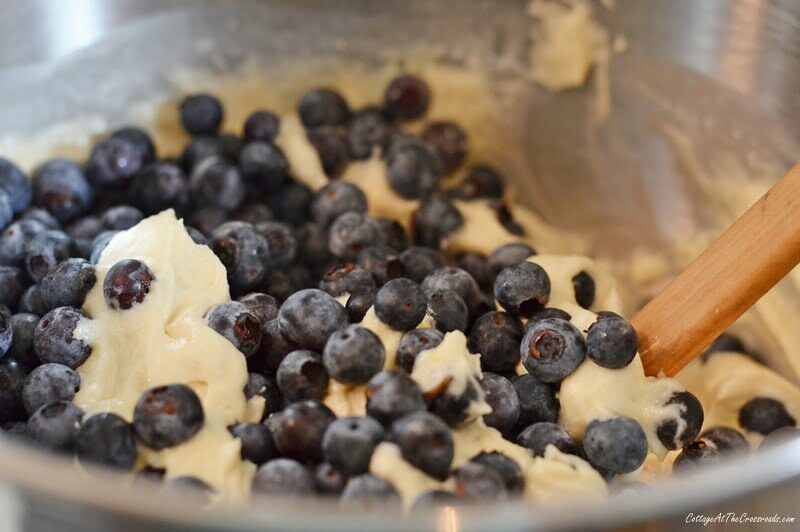 Fold in the blueberries and then pour the batter into the prepared bundt pan. Smooth out the top. Bake for 60 minutes. Sides should be golden brown and until a wooden skewer inserted in the middle comes out clean. Do NOT overbake! Allow to cool for 15 minutes before inverting it over a serving plate. Y’all, it’s so good! Not too sweet and bursting with flavor! I gave it a light dusting of powdered sugar. Perfect with a cup of tea or coffee. Are you wondering why I haven’t shown you the whole cake? Well, it was dark when it finished baking and Leo was leaving to go on a golf trip early the next morning. So I sliced it up so that the guys could enjoy the cake! 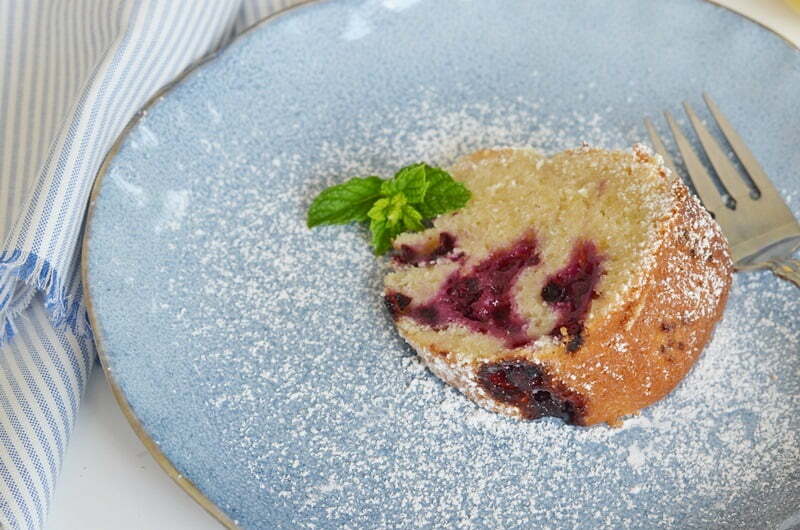 A delicious, moist cake bursting with zesty lemon flavor and blueberry goodness! Spray a large bundt pan with baking spray. In a stand mixer fitted with the paddle attachment, cream the butter and sugar until smooth. Add the lemon zest, vanilla extract, lemon oil, and eggs one at a time to the creamed butter and sugar mixture. Mix until just incorporated. In a small bowl, mix the fresh lemon juice and the buttermilk. Starting and ending with the flour mixture, add the flour mixture alternatively with the buttermilk mixture and blend after each addition. Do NOT over mix. Stir in the blueberries and pour the batter into the prepared bundt pan and spread until smooth. Bake for 60 minutes. Sides should be golden brown and a wooden skewer inserted in the middle should come out clean. Do NOT over bake! Allow to cool for 15 minutes before you invert the cake over a serving plate. If desired, dust the top of the cake with powdered sugar. Frozen blueberries may be used. Thaw them in a colander and allow the liquid to drain before using. If you cannot find buttermilk, you can make buttermilk by adding a teaspoon of white vinegar to 1 cup of milk. Let sit for a few minutes before using. when making the sphagetti sauce, do you use small, medium or large peppers and onions? Since I use peppers and onions from our garden, most of them are medium sized. 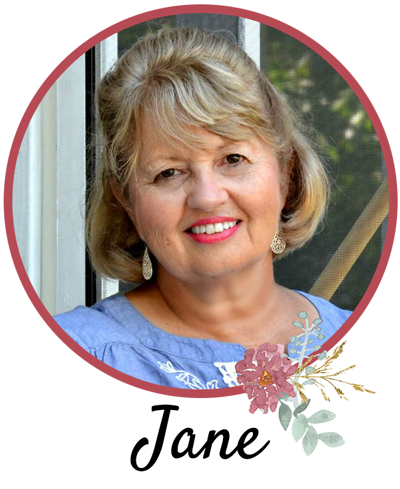 JANE, CANL I USE LEMON EXTRACT INSTEAD TO LEMON OIL. I HOPE TO HEAR FROM YOU SOON SINCE I’M BEGINNING TO BAKE THIS NOW. 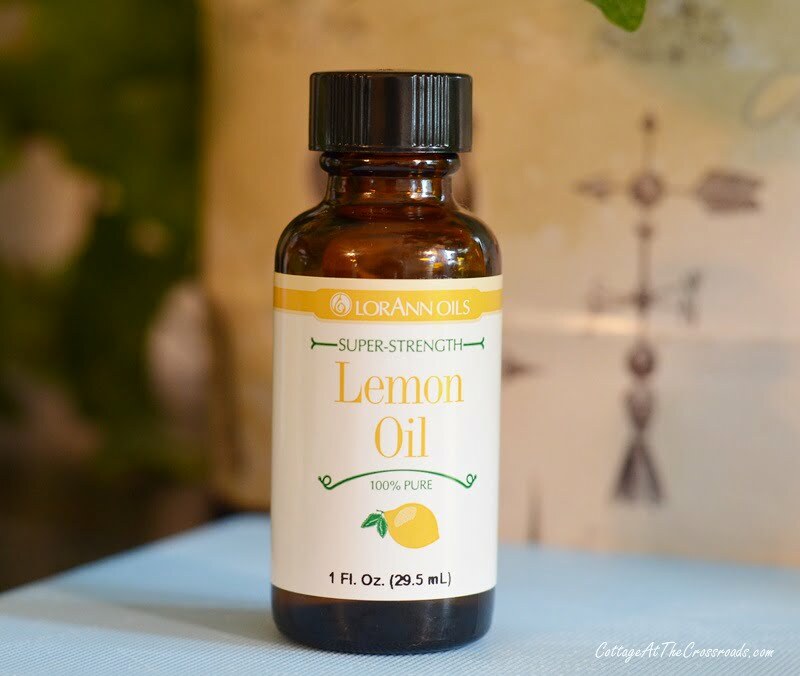 Yes, you can use lemon extract. The lemon flavor will not be quite as intense but your cake will still be delicious! Jane, THIS IS THE ULTIMATE!! I’m having a grand opening for our newly renovated library and I’ll be making 5 of these! THANKS! I’m so glad this recipe came along at just the right time for you, Elaine! You can make a lemon glaze for the top but I was trying to omit some of the sugar! To make the glaze whisk 2 cups powdered sugar, 2 tablespoons milk, and 2-3 tablespoons lemon juice together and spoon over the top.